MB-1 Standard Matthew Bellamy Signature, Other Shape Guitar from Manson Guitars. 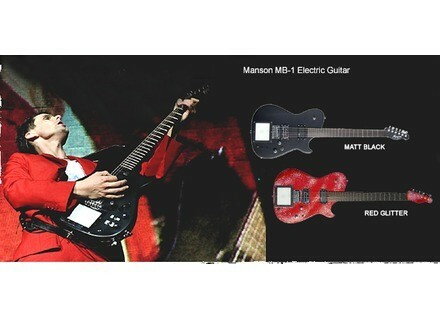 Manson’s Guitar Shop recently confirmed the launch of the MB-1 guitar range. This product is available exclusively from Manson’s Guitar Shop Exeter Devon with delivery of the first releases due summer 2009. Prices and delivery details of further models from the MB-1 range are all to be confirmed. Luthier Hugh Manson and guitarist Matthew Bellamy from Muse supposedly have a long standing agreement under which these guitars have remained special one-off creations only available to the Muse guitarist, songwriter and frontman. Incorporating finishes and electronics such as MIDI controlling screens or Fuzz Factory internals, many of these instruments have supposedly become famous in the band’s live set with several earning themselves unique identities. As an official Signature Guitar, production will commence on two models bearing the shape of the original guitar. The first will be in production shortly and deposits can be taken to secure summer 2009 delivery. It is available in Matt Black or for a small upcharge, gloss Red Sparkle. Future production models will include the “DeLorean” (an aluminium faced instrument) with optional Fuzz Factory, Phaser, and midi controller circuits incorporated. The price is still TBC, but we will accept orders for those interested, delivery likely to be autumn 2009. All guitars are made in the UK. For full spec please visit the Manson Signature Guitars Page at www.mansons.co.uk/shopping/categories/manson-signature-guitars. VHT Releases the Standard 36 VHT has announced the release of the handwired 36 Watt Head from the Standard Series line, The Standard 36.